An unique temple to Lord Sri Ram in the sense that it is built on a palace!! There is an interesting legend behind this unique feature. Sri Madhukar Shah, the then ruler of Bundelkhand, was an ardent devotee of Lord Sri Ram. One day Lord Sriram directed him to go to Ayodhya to bring an idol of Sri Ram from there. The Lord also directed him to build a suitable temple to him at Orchaa and install the idol at that temple. But the divine voice asked the king to take care not to place the idol except where it is originally planned- that is at the sanctum sanctorum of the newly built temple. The ruler, excited by the vision, ordered the construction of a new temple to Lord Sri Ram at Orchaa. When the work on that temple is finished he rushed to Ayodhya to take the idol of Lord Sri Ram from there, as directed on his dreams. But things took an interesting turn thereafter; on his return from Ayodhya with the idol of Lord Sri Ram, he placed the idol at his palace for a while; forgetting the direction from the Lord Sri Ram that it should not be placed anywhere else. Suddenly, Sri Madhukar Shah realised his mistake; he tried to take the idol back from the floor. But it got stuck there; so he decided to worship the idol at that place itself and converted his palace as a temple to Lord Sri Ram. This is said to be the only temple in the country, where Lord Sri Ram is worshipped as a King. The palace is built on a square platform; its architecture is like a palace than a temple. 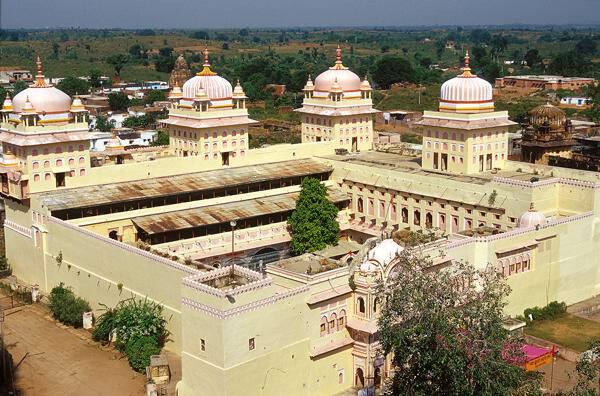 Orchaa is the capital of the Bundelkhand rulers from 16 to 18 nth Century AD. There are many palaces and temples within the fort complex. The Lakshmi Narayan temple (near to Raja Ram temple) and the Jahangir Mahal deserve a special mention. The fort complex is on an island formed by river Betwa; a feast to the eyes!! Orchaa is about 18 kilometers from Jhansi.